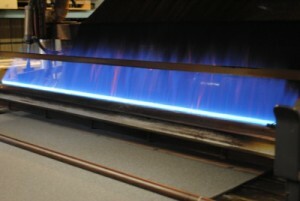 The flame is carefully controlled to ensure your product is high quality in strength and appearance. For those unfamiliar with flame lamination as a way to adhere foam to an additional substrate, the concept is fairly simple. Foam is run past a flame to create a thin layer of molten polymer. The surface of foam with the molten material is then pressed together with a layer of fabric, film or vinyl. A bond is created when the molten polymer material between the substrates cools. The resulting composite material can be used for many applications including medical, automotive, agricultural and industrial. The concept may be simple, but in practice there are a number of variables that contribute to bond strength and overall appearance of the resulting laminate. We consider our lamination technicians as the best in the business. With their experience and knowledge we are able to produce a product with excellent bond strength and appearance. Call or email to request a price list of laminates we currently produce or to check on custom lamination for your product.